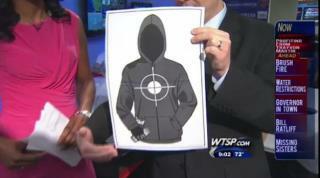 (Newser) – You might want to be sitting down for this one: An anonymous and extremely classy businessman has been selling shooting range targets designed to look like Trayvon Martin online, WKMG of Orlando reports. The targets don't actually use Martin's face but the intent is clear: They show a silhouette of a person in a hoodie with Skittles protruding from his pocket and a can of ice tea in his hand. I wish death, dismemberment, and shame upon this man's family. Jerry Cornelius has already brought the latter upon himself. It is distressing and depressing to think of the cesspool of bigotry and hatred that survives under the facade of an enlightened and tolerant society, that from time to time bubbles up to the surface.